Installing the software is very easy, thanks to the autoinstall function. By downloading the program, you accept the user license conditions. Download the .dmg file by clicking on the Save file button. After saving the file in your Download folder, double click on it. Banana Accounting 9 is now ready to be used. Double click on the Banana 9 icon from your Applications folder. The program is installed in your operating system language, but is always possible to change it from the Tools menu, using the Program options command. After opening the program for the first time, enter the license key and confirm by pressing the button Save license key. Then launch the New command from the File menu. 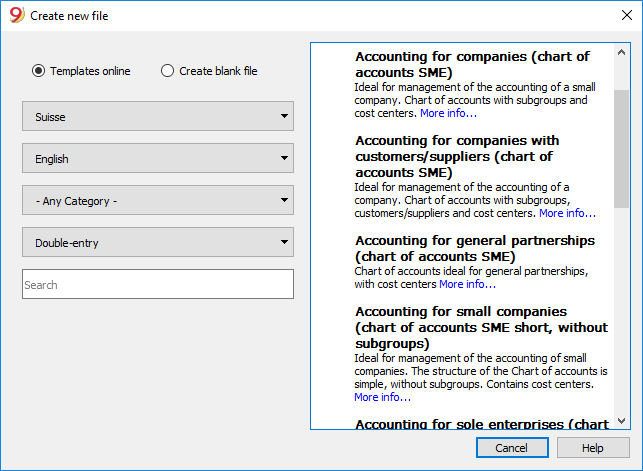 From the pop up window it is possible to choose the accounting type, the with or without VAT management option, the language and a template or example (or you can choose to open a blank file - not recommended). In case of problems while installing the program: verify in Apple -> System Preferences, Security & Privacy, to have chosen the option "Anywhere" instead of "Mac App Store and identified developers". See also Apple's internet page. NOTE: in order to uninstall the software, simply drag the Banana9 icon from the Applications folder to the Trash.